(Bloomberg) -- A small fire broke out Thursday afternoon in the basement of 425 Park Ave., the midtown Manhattan skyscraper that Ken Griffin’s Citadel is slated to move into once construction is completed. At around 3:30 p.m., about 20 emergency vehicles surrounded the 47-story tower, which is being built by L&L Holding Co. and is set to be finished in early 2020. Ambulances and stretchers waited outside, though New York City Fire Department employees said the fire was under control and no one was injured. 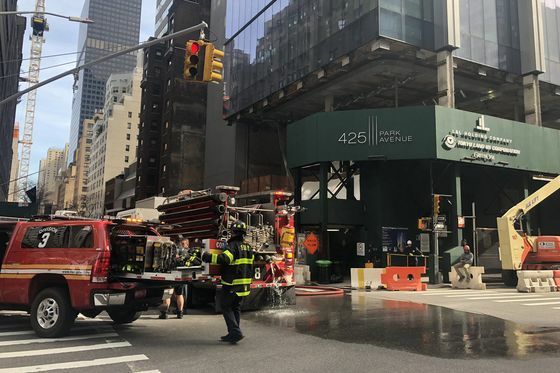 “The fire was put out quickly with a single fire extinguisher prior to the FDNY’s arrival,” Jacqueline Hlavenka, a spokeswoman for L&L, said in an emailed statement. She said the company is working with FDNY and the Department of Buildings to determine the cause. Citadel signed a lease in 2016 to anchor 425 Park, and the hedge fund recently agreed to expand its space in the tower to about 331,800 square feet. The building is on Park Avenue between East 55th and East 56th streets.